Each year, the J. Paul Getty Museum's Education department welcomes one established, mid-career artist to take part in its Getty Artists Program, allowing them to create and implement a project of their choosing. The artist is given the freedom to select an audience, and develop the focus and format of his or her project. Past Getty artists have included Mark Bradford (2010), Jennifer Steinkamp (2011), and John Divola (2012). 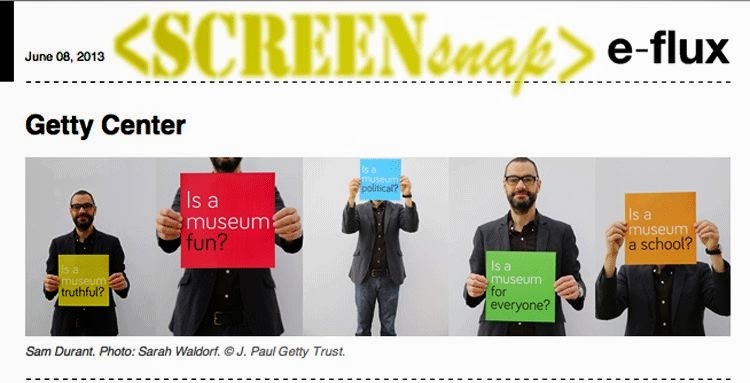 For 2013, the Museum has invited Sam Durant, whose project will prompt visitors to the Getty Center and online to respond to thought-provoking questions about the role of museums. Durant is a multimedia artist whose work features a variety of social, political, and cultural issues. Often referencing American history, his work explores the varying relationships between culture and politics, engaging subjects as diverse as the civil rights movement, Southern rock music, and modernism. "It's important for museums like the Getty to engage with contemporary artists and our varied audiences," explains Timothy Potts, director of the J. Paul Getty Museum. "The beauty of this program is that it accomplishes both of those things. In working with artists like Sam, we partner with highly creative individuals and give them the freedom to work with us in engaging our audiences. We all learn new things through the process." Beginning May 1 and continuing through July 2013, Durant presents What #isamuseum?, a project prompting visitors to explore the functions and roles of museums in contemporary life. For the project, Durant has curated a series of provocative questions about the nature of museums including "Is a museum for everyone?" and "Is a museum political?," and posed these questions in unexpected places throughout the Getty Center site, such as on floors, tram windows, the "Today at the Getty" handouts that every visitor receives, and on paper napkins in the café. Visitors can respond to Durant's questions in several ways. An iPad station in the Museum's Entrance Hall will encourage visitors to share their thoughts with others on-site, where a monitor will spotlight responses in an effort to encourage dialogue. Responses to the questions can also be submitted via Twitter (@isamuseum and on the website http://www.isamuseum.org/. Explains Durant, "By expanding the conversation and encouraging different forms of response, participants can become active within the project and even change the debate around the initial issue." On Tuesday, June 11 at 11am PDT, artist Sam Durant will participate in a live Google Art Talk http://www.e-flux.com/announcements/2013-getty-artists-program-sam-durant/ . He will be joined by Toby Tannenbaum (Getty Museum), Robert Sain (Centre for Living Arts), Pablo Helguera (Museum of Modern Art), and Jessica Cusick (City of Santa Monica). The group will discuss the function and role of museums, as well as the artist's role within it. Expanding upon What #isamuseum?, this discussion focuses on the purpose, importance, and politics of museums. Additional information is available at http://www.e-flux.com/announcements/2013-getty-artists-program-sam-durant/. Sam Durant's work has been widely exhibited internationally and in the United States. He has had solo museum exhibitions at the Museum of Contemporary Art, Los Angeles; the Municipal Museum of Contemporary Art in Ghent, Belgium; Govett-Brewster Art Gallery, New Zealand; and the Museum of Contemporary Art of Rome. Durant has taught at California Institute of the Arts in Valencia, California since 1995, and currently lives and works in Los Angeles.